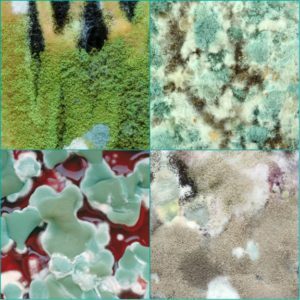 At ServiceMaster of Columbia, we know mold, and we’ve put together the essentials you need to know about the different types of mold found in homes. Molds produce irritating substances that may act as allergens in sensitive individuals. Some molds produce toxic substances. Houses with mold often have a musty smell. Mold requires an organic food source which is found in and on building materials such as cellulose, wood, insulation and drywall. Mold is spread by microscopic airborne particles called spores. Alternaria is a common outdoor mold that thrives on vegetation, but can easily find its way indoors. According to the University of Missouri School of Medicine, Alternaria has been found in more than 90% of house dust samples taken for a study conducted by the National Survey of Lead and Allergens in Housing. Alternaria often enters the home through windows and doors, where it can and does grow on moist surfaces. Alternaria is an allergen and known trigger for people suffering from asthma. Another common mold that lives both outside and inside your home, Aspergillus develops in warm, moist places and poses a health hazard for anyone with a compromised immune system. Aspergillus produces inhalable spores that are harmless to most people. However, anyone with a weakened immune system, lung disease, or respiratory condition is at risk for Aspergillosis, a respiratory condition which claims the lives of hundreds of thousands of people every year. Cladosporium is a pathogenic fungi often found outdoors on plants. Unfortunately, it also is common indoors in areas with high moisture levels. Cladosporium can grow on surfaces such as walls, woodwork, and carpets that have suffered water damage. It also can be airborne, triggering allergies and asthmatic reactions as well as sinus, eye, skin, and even brain infections. Penicillium is a mold commonly found on foods — the familiar fuzzy, greenish-grey junk that forms on fruit and other produce. It can also form on various household surfaces like wallpaper, draperies, rugs, carpet, and even within fiberglass duct insulation. Like any mold, Penicillium thrives in moist, warm conditions and may develop in an area of the home that’s suffered water damage or otherwise has a moisture issue. Alternaria, Aspergillus, Cladosporium and Penicillium are not the only types of mold in homes. Stachybotrys (or “black” mold) is a dangerous mold that can produce mycotoxins. These mycotoxins may cause serious health issues such as breathing difficulties and other respiratory problems. Black mold must be removed from the home by professionals. While annoying and potentially harmful to your health, mold in the bathroom, laundry room, basement, and other areas of your home can be removed without damage to affected surface areas. Most mold issues are resolved easily with a simple cleaning of baking soda and vinegar. However, large mold problems on walls, ceilings and basement foundations require expert professional assistance from the teams at ServiceMaster of Columbia. Think you have mold or would like more information, please contact us at 573.443.8383, the Master of Disaster!